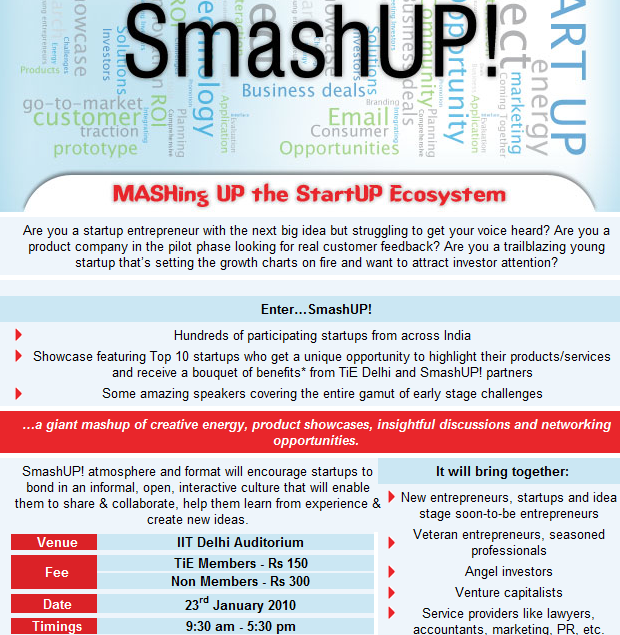 TiE Delhi is organizing its first StartUP event titled “SmashUP!” at IIT Delhi on Jan 23rd. So if you are a startup looking for a platform to showcase your product/service “SmashUP” is just for you. Given the scale at which TiE operates it would be a great opportunity to network and spread the word. I’ll be attending “SmashUP”, would you? This entry was posted in events, start-up and tagged angels, delhi, entrepreneurs, investing, networking, smashup, startup, tie, vcs on January 9, 2010 by mayank.